Cyber Monday 2017 surpassed expectations and hopes. 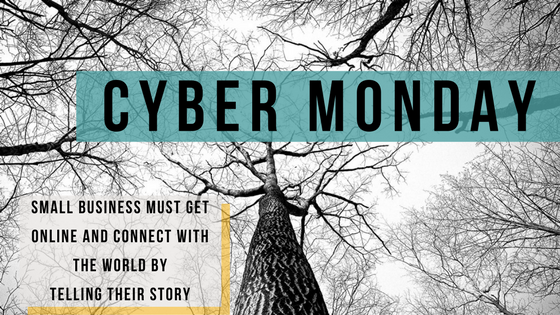 Here is a re-cap of Cyber Monday and what it means to small market, small business. Small business must tell their story online. Three part “magical” mix to telling that story begins with “you.” Learn more below. Small Business has to have a presence online! As anticipated, Black Friday, the weekend, and Cyber Monday, proved to be very good for business. Taking this momentum into the holidays is possible, but also challenging for marketers. Analysis of sales from this past weekend fully align with the realization that online marketing efforts are critical to capitalize on e-commerce sales. 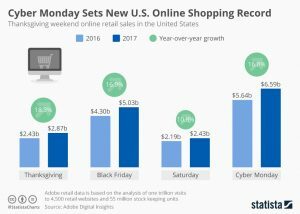 According to Statista, pulling data from Adobe Digital Insights, the following illustration portrays the significant shift in year-over-year growth in the online shopping market. eMarketer reports that retail e-commerce sales will experience 15.8% growth this 2017 holiday season. What does this mean for small business marketing? This illustration represents opportunity and a positive trend in consumerism and the importance of e-commerce. Often in smaller markets, small business owners want to pursue a stronger online presence, but are still very focused on the brick-and-mortar approach, even stuck in traditional marketing models. It is important to shift from the “mindset” that effectively developing an online presence is just too difficult, too competitive, too time consuming, cost prohibitive, or not important enough to pursue diligently. For every one of these negative assumptions, there are numerous positive reasons to really focus on an online presence. This is true to all sizes of businesses, from large down to the “mom-and-pop” business, as it is absolutely critical to get in front of the right consumer and the right time. An online presence, will help to accomplish that. Target marketing is more easily achieved through digital marketing than ever before and when a business finds the magical mix, positive outcomes follow. Yet, regardless of whether you focus on digital marketing more or give a new push into traditional media, the key to success is getting the message right. It is no longer about just putting a coupon out into the market. It is critical to get consumers to engage with your brand. But you may be asking, what is that magical mix? What is the “Right” Marketing Message? Starts with “telling your story.” Make your marketing message: (1) personal; (2) authentic; and (3) real. This means your message needs to identify with your consumer. It has to be something that they value and want to know more about, that satisfies a need or helps them in some way. The message has to be authentic. Consumers are more savvy than ever. They know when a deal is too good to be real or promises things that probably can’t happen or that are questionable. Consumers don’t like fake and misleading messages and they know the difference. The brand needs to be “real.” This means trustworthy and makes sense. Connect on an emotional level and be genuine when you do. 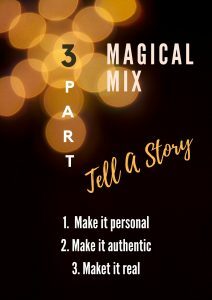 Every time you create a message whether it be for a print ad, content on your website or Facebook page, or digital ad, apply the “3 part magical mix rule.” When telling your story, did you make it personal, was the story authentic, and was it real. Remember the power of video. Story telling through video and even static ads, with text overlay, can increase conversion from 200% to 1500%.